This could be a very expensive movie to watch, but I’m committed. The DVD didn’t cost much – about $6.00 plus shipping and handling. It’s the international/all formats DVD player that could be the issue, but even that won’t deter me from seeing it. The popcorn popper is ready. As my regular readers know, the Irish picture book author and illustrator, Oliver Jeffers is one of my very favorite children’s book people. One of the (very) few authors whose books I will order unseen. He is just that good. And my favorite of Jeffers’ ten picture books is Lost and Found. It’s the one about the lonely penguin who finds a friend. I know it sounds cliché, but if you don’t know the book – seek it out! 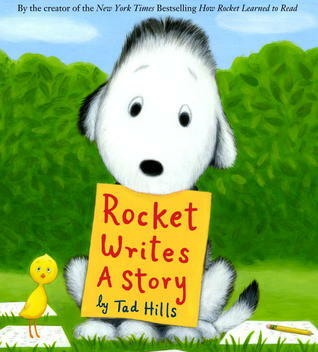 Rocket Writes a Story by Tad Hills – How cute is this cover! A sequel to How Rocket Learned to Read. I can already see the teachers finding fun ways to use this one! The New Sweater by Oliver Jeffers – Jeffers’ picture books are becoming automatic purchases. Every one of his books, especially Lost and Found and Up and Down, are loved by our students – and we read them regularly. The Great Unexpected by Sharon Creech – a new novel by Sharon Creech (Walk Two Moons) is always reason to celebrate! 1. The Artist Who Painted a Blue Horse by Eric Carle. A win-win for teachers and students. Art teachers will especially love this book about the power of creativity. 2. 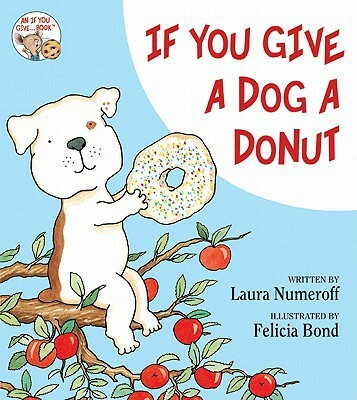 If You Give a Dog a Donut by Laura Numeroff. Talk about “money in the bank” for story time. Whenever I have a few minutes, I can pull any of the books from this series off the shelf, and the kids are happy. And this wins for cutest cover hands down! Pair this book with Laurie Keller’s, Arnie the Doughnut, about a donut who becomes a dog! I know. It’s confusing. But out dog, Arnie, was named after this charming book. 3. Stuck by Oliver Jeffers. Jeffers, the British author of Lost and Found, is one of my favorite author/illustrators. His stories are beautiful and joyful, two qualities not to be underestimated in an often loud and crazy world. 4. Around the World by Matt Phelan. Phelan is amazing. I loved his graphic novel about the Dust Bowl, The Storm in the Barn. This one about three historic journeys looks equally compelling. 5. The Fingertips of Duncan Dorfman by Meg Wolitzer. This is Wolitzer’s first novel for young readers, and I love the premise about three kids at a national scrabble tournament.